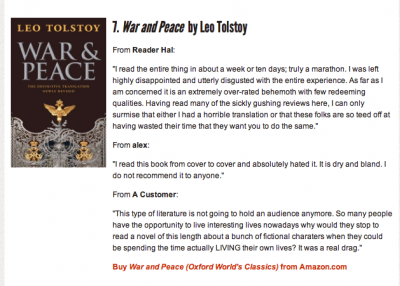 Jan 2: Should You Read War and Peace? I am not the best person to answer the question. Because I have not read War and Peace. (YES. I KNOW. THE SHAME. *) But I’m a good person to put the question because I’m a fluent Russian speaker, I have lived in Russia and known many Russians. And I have not read War and Peace. And I have not suffered as a result. Or so it seemed to me until this year. Here’s the trouble: this is the year of War and Peace. It’s the 145th anniversary of the novel’s publication in 1869. There’s a BBC Radio 4 jamboree celebrating the 1,400-page saga currently on air. And this autumn there’s a huge BBC 1 adaptation, produced by Harvey Weinstein and starring Adrian Edmondson, Greta Scacchi, Downton Abbey’s Lily James, screenplay by (of course) Andrew “Pride and Prejudice” Davies. So if there was ever a time to read War and Peace, this is it. Verdict: it must be read and this is achievable by autumn. Also recommended: Tolstoy’s “secrets to a happy life” and this very funny exploration of who has and hasn’t read War and Peace by Tanya Gold from 2005. * I feel no shame. Read what you want not what you feel you should. 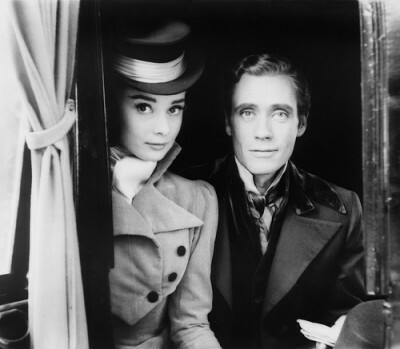 Pic: Audrey Hepburn and Mel Ferrer in the 1955 film of War and Peace.